While Israel may be a land flowing with milk and honey, it’s not as well stocked with another important liquid: water. With few rivers and lakes and rain only in the winter, the country has repeatedly been short on water. Of course, Israel isn’t short on water, since it’s right on the Mediterranean Sea; it’s short on water that is fit to drink. But Israel has found an incredible solution. It has built five desalination plants, which together supply over 40% of the water Israel needs. These plants have one main job: to take the salt out of seawater. Seawater is mostly made up of water molecules, of course, but also has other elements dissolved in it. The molecule primarily responsible for making water undrinkable is sodium chloride, otherwise known as salt. When salt is eaten as a solid, sodium and chloride are bonded together as the molecule NaCl, and the molecules are stuck together in crystals. But when dissolved in water, Na and Cl float free from one another as separate ions, each ion surrounded on all sides by water molecules. Since salt in water does not clump together, there is no way to simply scoop salt out of the sea, or filter it using a strainer. The desalination method Israel uses in its largest plants is called reverse osmosis. In reverse osmosis, saltwater is hurled at a plastic filter with holes big enough only for the water molecules to pass through. Since Na and Cl are too large to fit through the plastic membrane, the salt stays on one side and only pure water reaches the other. The method works because water molecules are much smaller than both Na and Cl atoms. Israel has managed to make desalination by reverse osmosis cheaper than ever before, but the costs of the process are still not negligible. 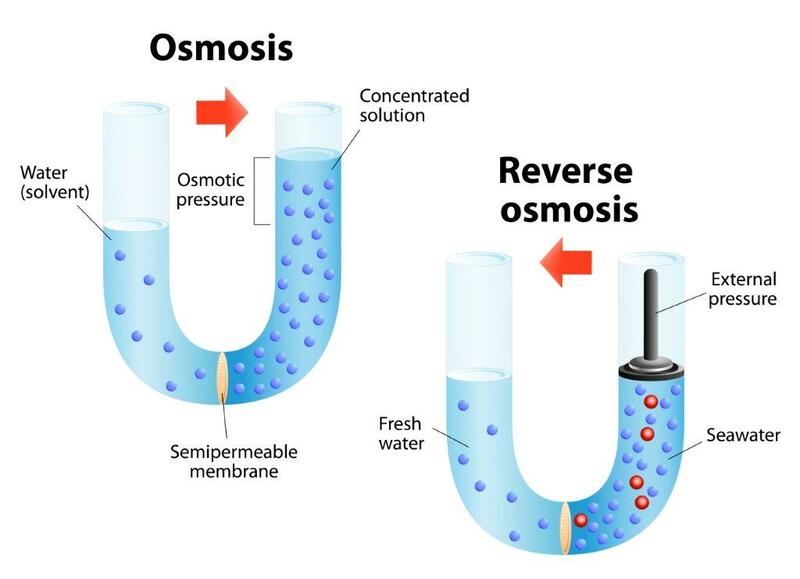 Besides the materials required for the plant and the cost of upkeep, reverse osmosis must be fueled by an energy source. Water cannot simply progress peacefully through a series of membranes; it must be put under high pressure and forced through them. The amount of energy the plant needs depends on the osmotic pressure of seawater. In natural membrane systems, like a cell surrounded by a lipid membrane, water moves from the less salty to the more salty area. It’s as though water is desperately trying to equalize the solute concentration on both sides of the membrane, and will go to great lengths to achieve its goal. If there’s more salt inside a cell than outside, water rushes in, and the cell membrane swells outward. The force water exerts as it expands the cell is called the osmotic pressure. The phenomenon of osmotic pressure is important in biological contexts. But since it leads to the further mixture of salt and water, it is the opposite of what we want in a desalination plant. In order for water to send water away from saltier areas instead of towards them, the plant must apply a force that exceeds the osmotic pressure. This is why reverse osmosis requires energy and costs money. At Israel’s largest desalination plant two enormous pipes carry in water from the Mediterranean Sea. Once the water reaches the plant, which is called Sorek, it progresses through stacks of reverse osmosis membranes. Not all of the water makes it through. If it did, you would end up with a hard block of salt stuck to one side of the membrane, which would be very difficult to clean or remove. Instead, some water stays behind with the salt. This leftover water is called brine. Another large pipe carries the brine from the plant back out to sea, where the salt quickly becomes dispersed. After the water has passed through the reverse osmosis membranes, newly pure and fit to drink, it is pumped all around Israel, to my home and yours.